The Pixelache Festival 2013, held this year in Helsinki, Finland, had a dedicated section for the international Bricolabs group, to wich we adhere from many years as ex Poetry Hacklab (now officially Poetry Bricolab). Into the collective Bricolab Mailing List there was a call to create an artistic installation about bricolabs. While in Montalbano Elicona, where some time ago we were partner and guests at the Trasformatorio artistic event, I discussed this with Jerneja Rebernak, proposing this idea: to write a software that read the entire Bricolabs mailing list archive since 2006, extract 3 random groups of words from different messages and compose them together to form a random “haiku”. 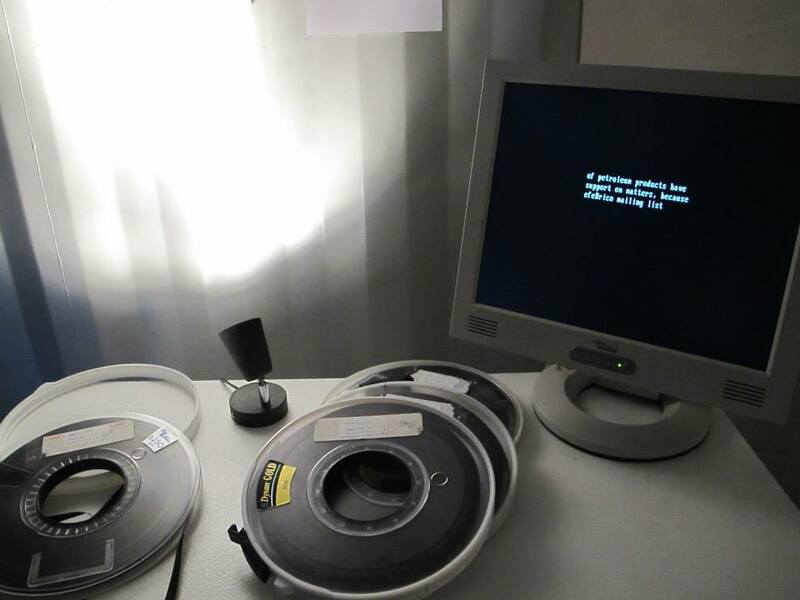 Moreover, my idea was also to copy this entire archive in four ancient magnetic tapes recovered at our Computer Museum and to create an installation with them. My coding skills are not so high today: i’m almost a PDP-11 and old computer dinosaur , and was also natural to involve all Freaknet / Poetry Bricolab / Museo dell’Informatica Funzionante group in this work… so was born the Python code that you can download at the end of this article. To start this haiku program we need something simple to use: so I got back my GNU/Linux Dyne:Bolic Distro creation Howto, and I create a Mini Live Debian Distro, that start in text-only mode on every computer from an USB pendrive, lauching haikus on the console screen. Haikus won’t be saved; they come on screen, stay a while, and disappear. Software was written by Nino “Nignux” Giudice, with some minor tweaks and bugfixing by Sebastiano “Geenna” Gennarini, Daniele “Eriol” Tricoli and “Steppenwolf” plus many hints from all of our group. Moreover, during the Bricolabs conference held in Helsinki, a video made by us describing our work at the Museum was screened. The conference video can be seen at this link. What follow is the abstract we wrote to present our work at the Festival, links to download the code (that can read every archive in Mailbox format) and some pictures of our installation in Helsinki. We want thank a lot Jerneja Rebernak, Felipe Fonseca, John Hopkins and all the Bricos over there, for their big efforts in the fantastic Bricolabs work done at Pixelache 2013! Since the year 2006 Bricolabs exists as a south-to-south network connecting researchers, poets and pioneers active investigating the new loop of open content, software and hardware for community applications. Besides on-site happenings, Bricolabs consisted of an on-line discussion space focused on bringing people together with new technologies and distributed connectivity, unlike the dominant focus of the IT industry on security, surveillance and on the monopoly of information and infrastructures. This art installation is dedicated to the Bricolabs network and its brulicating flow of ideas. A generative language software written in Python formulates “haikus”(*) based on the archive of on-line discussions; each haiku will be printed on the screen for a short time, then the next will follow. Haikus are not saved, they just come and go away. Four old computer tapes from our Computer Museum are there, containing a partial backup copy of the mailing list (because the ml is in progress, right now! ), meant to be stored somewhere, in a safe place, hidden for the future, as a picture of the bricolist today. ” […] The Japanese Haiku is strictly disciplined to seventeen syllables but since the language structure is different I don’t think American Haikus (short three-line poems intended to be completely packed with Void of Whole) should worry about syllables because American speech is something again… bursting to pop. Click on this link to download the bricohaiku source code.